Fallon meets Ben, and inspiring novelist, the day before her scheduled cross-country move. Their untimely attraction leads them to spend Fallon's last day in L.A. together, and her eventful life becomes the creative inspiration Ben has always sought for his novel. Over time and amidst the various relationships and tribulations of their own separate lives, they continue to meet on the same date every year. Until one day Fallon becomes unsure id Ben has been telling her the truth or fabricating a perfect reality for the sake of the ultimate plot twist. WOWZA!! Let me start off by saying that this is my very first Colleen Hoover book that I have read, and she absolutely did not Disappoint!! I have been following this author on Instagram, and hearing raves over all of her books. (and basically loving her even before reading her books!) So I'd figure I would pick her newest book to read with my amazing friend, who also happens to be a book blogger and instagrammer Floralsndragons (Vanessa). We decided to have November 9 for our first read for our new Book Club. Okay so right off the bat there is so much going on. The story is definitely fast paced, but at the same time, you get all that you need to know throughout the novel. Which I loved. There is a lot of pure, strong, and raw emotion, hatred, love, insecurities and so much more!! Vanessa said it pretty well that, "November 9, isn’t just a story of a date. Heck, it isn’t really a story about romance crap. It’s about two people, unexpectedly are tangled together by what happen in the past and what would be the future. It felt real and genuine. 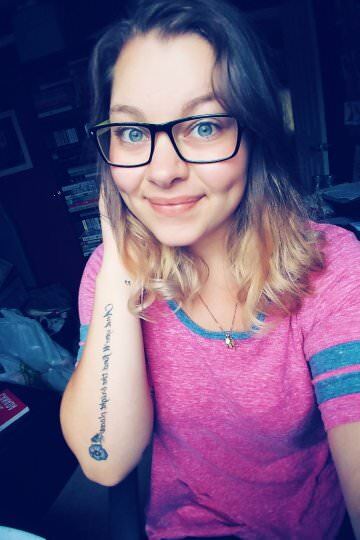 As if there are two people out there name Fallon and Ben who happened to want to tell their story on how they became as one." I immediately started falling in love with Ben...and Fallon haha!! The love was of course Insta-love, which was talked about a lot. I really think that because it was all about book lovers, writers, and typical hopelessness in the romance department, it had me flipping the page faster than you can imagine. While reading, I could easily tell that Fallon was the darkness, and Ben was the light that would otherwise be dim. However after reading until the end, I found that it was actually both ways. Ben became the darkness, and Fallon became the light. He somehow possessed this type of love for Fallon that she didn't think she would ever have after her accident a couple years ago. I don't think that when reading, I've ever laughed so much out loud...I've for sure gotten a lot of stares and looks by people while reading this book, but honestly I did not care one bit! There was so much humor in this novel, I was in a constant sate of smiling... so much that my face felt weird when I stopped reading...you know what I mean!! Also when it got to the really romantic parts, I have to say I was pretty red and had a lot of goosebumps. I seriously don't know how Colleen Hoover does it, but she gave me all the feels in a book that should have been much longer than it was! So there were of course a couple quotes that I found stood out, and kind of made the novel overall. They were just pretty powerful, you knew that there was going to be heartache in the end. "You made me feel like the scars were part of what made me pretty"
So I was absoutely gutted when Fallon was in New York and Ben was in L.A. and she was waiting for him in New York for their third November. Sometimes even when you make plans, they don't always get to happen. But both Ben and Fallon sure found a way to make it all happen. I was so happy with what they both did for one another. It just shows that there was true sacrifice of love when faced with loss. They may have not really had the most "normal" relationship, but I could feel something from the first November. They both were vulnerable at times, and somehow knew they had to be there for one another. Of course there were some steamy scenes! What got me the most was the aftermath of the first twist from the novel. Little did I know that there was an even bigger turn come the 5th November! So for those of you who have read this, or even those who are going to (because let's face it you should be reading this!) when you get to page 188 you will understand why it all hit me so much. I think that speech Fallon gave, was said so well and although I know it hurt more than it should, it was something that needed to be done. Also when it got right to the ending and you find out about what really happened to Fallon on November 9th two years ago, and that letter that Ben wrote to Fallon with his manuscript that he left at her front door...lets just say that I was pretty much like Jennifer Lawrence for a good solid three hours, and then some through the night. Overall I am so in love with this book. I think Colleen Hoover is now one of my most favourite authors, and this is so far my #1 by far. There was so much love, but at the same time it was heart-wrenching to read this relationship. That last twist that was revealed had me questioning "WHAT IS LIFE" for a while. It had my heart racing, my face flushing, and shallow breathing. I have never become so involved in a book like I have for this one. I've said it once, and I'll say it again, that was probably my biggest book hangover I have had to date. 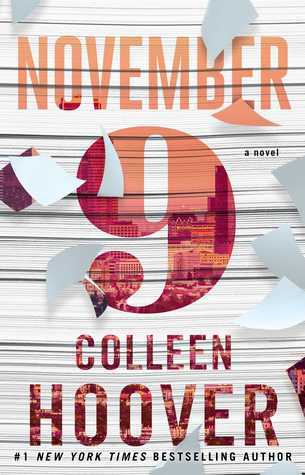 Writing this review was definitely hard, because there is so much I want to say about it but can't because of 1) spoilers and 2) no words can fully explain THE FEELS you will get when reading November 9. It was all so beautiful and even though the ending should have made me feel great, all I wanted was more of it. I hate the fact that it ended the way it did, because I think that there should have been a lot more to the story! Here are Vanessa's overall thoughts on November 9: "I’ve laughed so hard to the point snorted, I’ve cried so hard that my face hurt, and I felt the pain—when you love someone, but you’re willing to let them go for the sake of their dreams. When you read this, all of it. Understand, that life works in the most mysterious and messed up ways. We are all someone desiring someone that would be there to make us strong, to believe in us when we don’t believe in ourselves. Colleen Hoover, made you believe that love can actually conquer anything from the most hardest and devastating obstacle that you could possibly face to the moment you realize what matters most. 'Love should be between two people, and if it isn’t, I’d rather bow out than take part in the race.'" So there is my review, and some of Floralsndragons for November 9. I hope you enjoyed it, and I seriously urge you to pick it up! I need more people to feel the same as I do after reading it!! I stumbled across your blog entry recently and it has made me think. In your entry you state that Colleen's book was such an enjoyable read, it became your #1 book. I totally agree with you - I feel the same!!! I read all of Colleen's books this year and I had over this one a tremendous book hangover. I loved the insta-love story REALLY and I love Colleen's humor even more, but the plot twists totally cought me off guard every time. I don't know if you remember their 4th November (I don't want to post any spoilers so: the 3rd one is the one where he wanted to come to NY but then it ended up the other way round, so I think you know what happened on the 4th) but I was totally surprised about what he'd "done" this year. When I reached the part where she reads the manuscript, I was a hopeless mess. I had to put it away because that's the most shocking twist I've ever read, but also after I calmed down I didn't want to face the truth. I would have never imagined something as sad and heartbreaking as this twist when I started the book. And I L-O-V-E heartbreaking stories!!! Although I haven't read all of Colleen's novels (But definitely plan on it!) I can only agree with literally everything you said! I find she keeps me hooked on these characters and fall for them no matter what happens! Total shock for sure!! Thanks for commenting! !